The internet was abuzz this weekend with news that Swedish magazine Teknikens Värld had found the 2012 Jeep Grand Cherokee poses a substantial rollover risk during a drastic lane-change maneuver but the Chrysler Group has been quick to defend their top-selling SUV, supporting further testing with no instances of near-rollovers and pointing out that the original Jeep tested had been intentionally overloaded. The video that started this whole chain of events showed the hosts of Swedish magazine Teknikens Värld (Technology World) driving the 2012 Jeep Grand Cherokee in a test that they call the Elk Test. This test consists of driving the Grand Cherokee down a short course at 39.5 miles per hour when they simulate a drastic, sudden lane change maneuver. The video of the Grand Cherokee performing this test shows the popular Jeep ute quickly climbing onto two wheels before the driver makes the move to bring it back down onto all four wheels. The host of the video goes on to point out that the Jeep Grand Cherokee sold in Sweden and used in this test comes with 20” wheels, a rollover protection system and an advanced stability control system but after he proclaims that they do not work – he goes on to insist that Chrysler stop selling these vehicles in Sweden. Click here to view the video at Autoblog.com. This rollover situation certainly comes as a concerning situation but there was an interesting twist in a statement issued by the Chrysler Group. The Jeep Grand Cherokee shown had been loaded well past the stated weight limitations and it was this excessive overloading situation that is at fault for the two-wheel driving shown in the Teknikens Värld video. In other words, the production staff at Teknikens Värld has rigged the test so that they could get the Jeep to rise up onto two wheels in such dramatic fashion. When Teknikens Värld informed the Chrysler Group of the results of their testing, Chrysler engineers quickly began testing of their own but they were unable to replicate the wheels-up situation. Teknikens Värld provided the same test course and procedures, this time with Chrysler engineers present and with three different Grand Cherokee models put through the test 11 times – there were no wheels-up results similar to the ones shown in the original video. 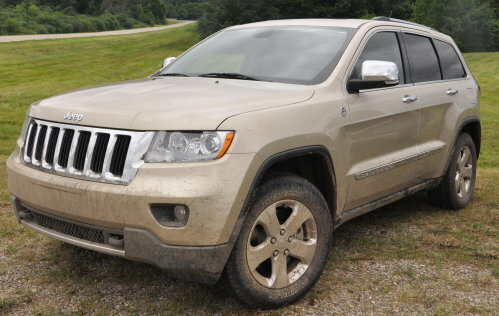 The Chrysler Group has also pointed out that the 2012 Jeep Grand Cherokee is a Top Safety Pick by the U.S. Insurance Institute for Highway Safety as well as meeting/exceeding all safety requirements set by the US government. Some may ask why Teknikens Värld would intentionally overload the vehicle to cause the 2012 Jeep Grand Cherokee to almost roll over without mentioning it in their video showcasing the problem. After host Linus Pröjtz proclaims towards the end of the video that the Jeep’s safety features do not work, he formally asks Chrysler to “stop sell this car Jeep in this specification”. This statement quickly spread around the world as the popular Grand Cherokee was brought into such a negative light but the proof that the test was rigged shows that it was nothing but bad journalism in an effort to generate publicity for their publication. Their fake tests certainly achieved the result of getting plenty of attention from around the world but to be known as frauds probably wasn’t the attention that Linus Pröjtz and Teknikens Värld were hoping to gain. You certainly did not see the same video I did of the 11 run. It clearly show a problem with the jeep that is not found on other model. Your article is a fraud and to me show how your site is not worth reading. Check your fact, this is journalism. Getting paid by a company to cover the truth, this is just shameful. Maybe with someone your size no car can leave the ground no matter what and this is where you're coming from. But don't call them liar because your fat.